Aseir'd attack successfully connected with its target, dispatching the foe. The one that had been attached to his attacking arm was sent hurtling through the air. As it landed and noted that it was the only remaining combatant on its side the creature turned to run. Two of the the three nearby cat creatures were not going to let it get away and pounced on the foe. It turned to particles and disappeared into the air. The remaining cat had made its way over to Aseir and rubbed against its leg. The gem that was in the cat's forehead had started glowing and should Aseir be looking at his status he would see that he was no longer afflicted by the poison. The three cats gave a thankful meow before retreating in the direction they had been looking previously, leaving Aseir standing alone in the cave, but having gained some experience. Aseir grinned as he watched his plan work out with the best possible outcome. Or more like a better outcome. After all, his best hope was that the last monster would be shaken off by the attack. Instead it not only attempted to retreat but was still taken out in the end by the creatures that had once been its prey. He watched somewhat wearily as one of the cats approached but let himself relax when the cat began to rub against him. He heard an odd sound as the gem began to glow and as he suspected the effect turned out to be a curing of his poisoned status. He watched as the cats ran off and once they were out of sight his character slumped to the ground. Looking up to the ceiling he decided to give his mind a second to regain itself. He still felt a bit of adrenaline pumping. Slowly he inhaled through his nose then exhaled through his mouth. After a while of doing this, and once both his heart and mind had slowed to a steady and calm state again, he stood back on his feet. He then took a second to reconfirm where he had come from, where the cats had gone, and if there were any paths besides the two. If not he would begin walking after where the cats had run off to. The cave was larger than just the two paths. There was still a large portion of this cavern left unexplored. Should he choose to follow the cat creatures he would find a small entrance to an underground grove. As he examined his surroundings he would also see a path that looked overgrown with plants. Following this path would lead to a tunnel entrance that had a crisscross vine pattern barring entry. It looked as if the vines could be targeted and thus a bit of damage would likely clear the way. There were no sounds other than the background music to give him an indication on anything happening in any of the areas. Aseir would be free to choose any of the paths on a whim. Looking at the multiple choices before him he decided to take the path overgrown by plants. He wanted to explore as much of the dungeon as possible. Doing so usually meant avoiding the plot of the dungeon for as long as you could. His best guess was that following the cats Would be continuing the plot. Which left any path other than that one until the last second. Continuing down the overgrown path he quickly hit a deadend. At first he assumed it was a permanent deadend but decided to try attacking it in case it was a barrier that could be removed. When the vines started to clear away he smiled and proceeded to continue attacking until the vines were removed. Clearing the vines was a simple task and Aseir was able to move on unhindered. As he traveled the passage became more narrow and the light that had been illuminating the previous portion of the cave seemed to be fading. The path angled down once again and spiraled in what seemed to be a never ending path. After a few minutes of walking Aseir's progress would once again be impeded by a barrier of vines. His eyes would have no problem picking up the figure so it was unlikely that he would walk into it. Using the same method as earlier Aseir would have no problem dispatching this barrier as well. Moving passed the now open entrance Aseir would be standing in a massive cavern, at least three times the size of the previous one he was in. It was dark and the only light was provided by small glowing balls floating around the area. From what Aseir could see there was a small path leading to a landing of dirt. This small flat landing was at the edge of a rather large body of water that took up most of this area. From his current position it did not look like there was a way around the body of water. After clearing the obstacle Aseir continued down the path. He paid little attention to his surroundings and mostly just lost himself in thought for a bit. There didn't seem to be any immediate danger for now so he wasn't to concerned about being attacked. A little while after walking he came across another barrier in his path. Once again he promptly cleared the vines out of his way and continued on his way. He stopped shortly after going through the passageway however as a new sight came into view. A massive cavern with a pond at the end of what path was left. A dead end? Wanting to be sure before he made his way back he walked to the end of the path, looking at the floating balls of light as did so. Once at the ponds end he looked down at the water and was greeted by a faint reflection of his character. With so little light he couldn't see much of it but it was enough to confirm what he couldn't back in Mac Anu. Why he chose such a creepy look for his character he wasn't sure himself. Perhaps he simply thought it cool or something. He smiled and nearly laughed as the expression hid itself behind his character's latex mask. He looked back up at his surroundings for some last assurance that this was indeed a dead end. When Aseir moved to the edge of the water and looked out over it the floating lights around him would flutter about more rapidly. The light each of the floating orbs gave off also increased as something out on the water began to give off a light as well. From the left side of the lake a large green wolf-esque creature would appear. The creature was as large as a building and gave off its own light. The creature was walking on top of the water and as it walked by where Aseir was standing it looked at him. The creature bowed its head and orbs of light swirled around Aseir for a moment. After the lights finished swirling around him the creature lifted its head again and continued walking until it was out of sight once more. Once the creature left the area the floating orbs would dim and leave the area darker than when he had arrived. There was nothing more to see or do in this location. A look at Aseir's buffs would indicate that he had received a blessing from the creature. Aseir would be able to make his way back to the upper cave with no trouble. When Aseir began looking around he noticed what he missed while looking into the reflection of the water. The floating lights had begun to act diffirerently. Not long after the he noticed a larger, brighter light coming from the left. His eyes widened as he caught sight of the giant wolf going across the lake. The first thought was that he had run into a boss already. But when the creature looked at him and bowed it's head he let go of that idea and even bowed his own head out of reflex. He then watched as some of the floating lights began to orbit around him. Once they finished he opened his menu and as he thought the orbiting lights had been a blessing of sorts. When he closed the menu he realized the giant wolf was already on it's way out. Once again he bowed his head to it then began to make his way back. When he returned to the cavern he was originally at he took a quick look around but didn't see any other path that seemed interesting so he decided to finally follow the cats on the path they had taken. Upon returning to the main cave that he had first entered he would notice it seemed a bit brighter than his previous visit. He couldn't be sure if it was simply his eyes adjusting due to the dark corridor he had just exited or if it had indeed gotten brighter. Moving toward where the cats had ran Aseir would make his way passed several thickets of foliage until seeing what appeared to be another corridor. Moving down the corridor Aseir would notice that it was rather short, as he could see the other side upon exiting. On the other end of the corridor the cavern opened into another cavern. This one was similarly decorated in plants and on the other end of the cavern there was a slight orange hue. Aseir's gaze would likely end up on a wolf creature sitting in a similar fashion to the first creature he saw at the start of the dungeon. This one was slightly different as it was also adorned with wings. The creature was looking toward the orange glow. When Aseir made it back to the original cavern he noticed the room seemed a little brighter than before. Although it was strange he ended up attributing it to game graphics. He had played the occasional game or two where a glitch or camera view, he wasn't sure what caused it exactly, would end up causing the room to suddenly go dark or things would seem brighter. He continued on eventually passing some folliage and arriving in front of another corridor. Making his way through the corridor he arrived in another cavern of similar quality to the first on. There was mainly two differences from the first one. The first and most drawing to him was the wolf figure at the end of the cavern. 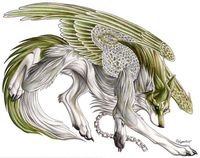 While it seemed somewhat similar to the first wolf he met there was a fairly obvious difference in that this one had wings. The second difference from the first cavern was a orange hue that the wolf seemed to be staring at. Due to the first wolf he had come across, Aseir three caution to the wind and walked up to this wolf. Staring at the hue he ended his walk standing next to the wolf. If the wolf didn't attack him at all in this time then he would say,"So...you the first wolves brother or something?" The creature turned to look at Aseir, "I do not know who you speak of. If you mean that lesser creature at the front gate then no, I am of no relation." The creature moved so it was now standing on all four of its legs, with its wings tucked away behind its back. "If you have time to ask me foolish questions then you should have time to assist me with the problem ahead. You were blessed by the Guardian. Show me the great one's blessing is not ill placed." Without waiting for a response the creature began walking toward the orange hue. Aseir was left with a few options. He could turn back and go the way he came, continue behind the creature and investigate the glow, or if he was looking around he would notice a small path to the right that was also able to be traversed. Aseir felt a inner debate go on in his head as to whether the first wolf was a lesser being because he was less powerful or if it was simply because he didn't have wings. He stopped himself from laughing, fairly certain that with how serious the winged wolf was he was likely to get angry at Aseir for it. Instead he watched as the wolf began to move forward towards the light. He had given the indication that this was going to be a fight, or at the very least something that would make use of the blessing he got earlier. He followed the wolf though normally he'd try and explore more before a big battle due to being afraid that completing a main quest of a dungeon would gate him out immediately afterwards. More than that however, he was afraid the wolf would continue approaching it even if he didn't follow. So he summoned his weapons preparing for yet another fight. This one would be easier hopefully due to it being two fighting instead of just one. The creature moved at a brisk pace with Aseir in tow. As they wound through the path the creature continued to speak to Aseir, "I am pleased that the Guardian sent someone and I trust the Guardian's judgement completely. If you are able to give the help needed you will be rewarded sufficiently. Ahead there is a creature that was sent to terrorize the inner sanctums of the forest. Vanquishing it will go a long way toward helping the peace of the inner sanctums." Ahead of them the path opened and became blackened. The foliage that should have been vibrant colors was instead charred remains of what once was there. In the clearing was a being of pure fire. 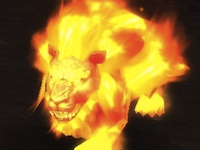 It had a tiger like appearance and lashed out at all of the greenery around it, spreading its burning destruction. "Happy to help," Aseir replied, only seconds later remembering that it was just a game. "However I can I mean." He watched as the scenery turned from it usual lively colors to a dead and charred remains of what used to be. They arrived to a openly filled with death and sounds of something rustling about in the area in which they came. He looked ahead and found the source of the fire was a creature of fire itself, a tiger like creature burning any live greenery left. Aseir smiled somewhat nervously as he watched it continue on like it was possessed. How the hell am I supposed to punch fire? I mean, I know that video games usually make it possible but all the same...it's kinda weird thinking about trying. Aseir turned to the wolf with wings. "So, any advice before we get started?" The creature looked over to Aseir, "Try not to die and watch for an ambush." With that the winged beast lunged in to engage the being of fire. The winged beast let out a howl and Aseir would see the wind swirl around him. The fire creature turned and set its gaze upon the winged beast and lunged at it baring its burning fangs. The fire creature struck the winged beast and it noticeably recoiled. It did not look as though it would win this fight alone.